NHS England has published National Safety Standards for Invasive Procedures, setting out the steps necessary to deliver safe care for patients who are undergoing invasive procedures. A multidisciplinary group of clinical practitioners, professional leaders, human factors experts and lay representatives developed the standards in response to a recommendation in the 2014 Never Events Taskforce Report, published by NHS England. Never events are serious incidents that are wholly preventable if the correct systems and processes are undertaken by competent staff. The term ‘never events’ suggests they never happen – but evidence demonstrates they do. In 2013-14, there were 98 wrong-site surgical errors; 134 retained foreign object incidents such as surgical swabs; and 54 wrong implant/prosthesis incidents reported in England. The effect on patients of surgical never events can be devastating, and can lead to serious harm or even death. The purpose of the national safety standards for invasive procedures – NatSSIPs – is to embed best practice by minimising the risks of variation in practice, so maximising consistency. 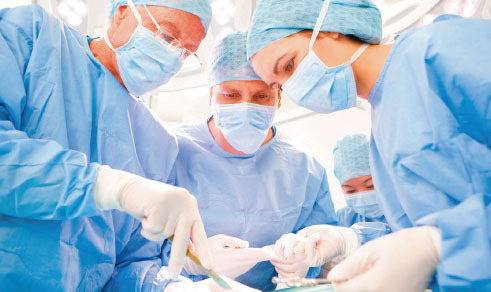 They provide a framework for NHS organisations to develop local safety standards for invasive procedures (LocSSIPs) that indicate the knowledge, skills and attitudes required to make surgery safe. The standards are built on best practice, and define what should be embedded in local working procedures. NatSSIPs are about standardising processes that are then harmonised across an organisation with LocSSIPs. Although these standards alone cannot prevent never events from occurring, when combined with the education of staff that promotes teamwork, and human factors training, the triad of standardise, educate, harmonise is complete. The 13 NatSSIPs are spilt into two categories (see below). Organisational NatSSIPs are the standards that underpin the safe delivery of procedural care, and sequential NatSSIPs are a logical sequence of steps that should be performed for every procedure session or operating list, and every patient. Procedural verification and site marking. Prevention of retained foreign objects. Registered nurses working in areas where invasive procedures are undertaken have a responsibility to ensure local standards are based on the founding principles of the NatSSIPs. Nurses should be proactive in this by becoming involved in their development and implementation. If local standards are already in place, there needs to be assurances that these meet the key steps of the NatSSIPs. This sense of ownership will help embed the standards in practice, and hopefully encourage an open culture of raising concerns relating to patient safety. Although the provision of safe care is a whole-team approach, nurses have a responsibility to ensure the LocSSIPs are adhered to and are accountable to both their employer and the Nursing and Midwifery Council. The keeping of clear and accurate records. Working within limits of competence. Raising concerns and acting without delay if there is a risk to patient safety. Healthcare organisations, royal colleges and regulatory bodies have committed to endorse and support these standards, to build them into their own guidance and training, and to make sure their implementation makes a real difference to patients. The RCN says the implementation of NatSSIPs will support all providers of care in England to develop and maintain their own, more detailed, standardised local policies. The college believes this will significantly contribute to improving the quality, effectiveness, and safety of patient care, as well as improving the patient experience. More specifically, they have committed to ensuring the standards are incorporated into any relevant nursing and midwifery RCN products, such as best practice guidelines and position statements, and to supporting the continued update of the standards as required.